Having retired from the CIA, three stalwart gentlemen, chronically depressed with work-related problems, took heart at the courageous activities of Edward Snowden, and formed Basilisk Press to purge their hearts of grief and guilty consciences. 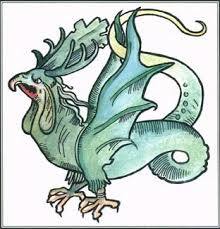 A Basilisk is a mythical Middle Ages creature, half rooster and half snake, whose very look turns a person unwise enough to look at him into stone. We have assembled a number of manuscripts which we hope will entertain our readers while causing spastic colon to our former employers. With luck, they too shall turn to stone. This entry was posted in Uncategorized on October 29, 2013 by vermontt. This entry was posted in Uncategorized on November 2, 2013 by vermontt.